Chocolate: Spreading the Love Beyond Valentine’s Day! So Valentine’s Day is over for another year. “Hurrah!” say the hardened cynics. “Booooo!” say the hopeless romantics. Here at Chocolat Chocolat, we fall resolutely into the latter category. Yes, the run up to Valentine’s Day is one of our busiest times of year, but our love for February 14th has more to do with us being such a soppy old bunch than because it’s good for sales (we like that too though!) 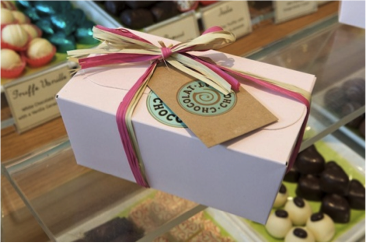 In the shop, there’s definitely a lift in mood as customers collectively think about the perfect chocolaty gift for their beloved. And who doesn’t love receiving a delicious chocolate treat as a token of affection? As far back as the 13th century, the Aztecs made the link between the cocoa bean and desire, with emperors said to consume the bean in large amounts before romantic liaisons! 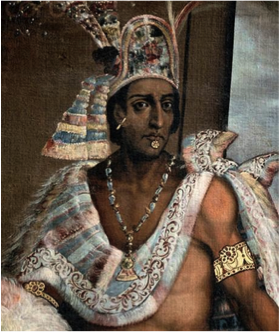 The Aztec version of chocolate wasn’t refined in the same way as modern day recipes; a 21st century chocolate lover would have found it bitter and astringent, with a hint of white vinegar and drying to the mouth (may we cheekily suggest that it could not have been conducive to kissing then?!) These days, chocolate-making processes have been fine-tuned (thankfully), and scientists are more cautious in their claims about chocolate’s aphrodisiac potential, but there are two chemicals in it which links consumption to feeling ‘amorous’. Chocolate contains both tryptophan, a component of the chemical serotonin that creates feelings of wellbeing, and phenylethylamine, which is released in the brain when people fall in love. However, many studies have shown that amounts in chocolate are too small to have any measurable effect, and that any feelings of wellbeing produced after eating it are probably psychological. Who cares whether it’s real or imagined? We love that chocolate makes us feel love! Even if its aphrodisiac qualities are somewhat unfounded, chocolate is high in energy-boosting chemicals including theobromine, magnesium and chromium, which all play a role in energy production. So having a few squares of the dark stuff at work in an afternoon means you’ll get home with plenty of energy and attention to lavish on your beloved! Giving chocolate as a gift will make you feel good! ‘It’s better to give than receive’ – we’ve all heard that before, and while we completely understand that chocolate lovers might find this one hard to believe, numerous studies over the years have proven the benefits of giving gifts to others on our mental and emotional wellbeing. Plus here’s a valuable fact for all the ladies out there: 70% of chocolate is bought for or by a woman, so we think your man will love you forever if you surprise him with a truffle or two! And surely this gives you extra brownie points and therefore carte blanche to share the sweet treat you’ve so thoughtfully bestowed? They’re our rules anyway, and we’re sticking to them! What do you think? Has being given chocolates from an admirer ever won you over? Or are you a big romantic who lavishes the gift of chocolate on your other half all year round?